Evie Brooks, 12, is at a crossroads: her mother, who was an American, has died, and her mother’s brother Scott insists that she should leave her home in Dublin, Ireland, and live with him in New York City. 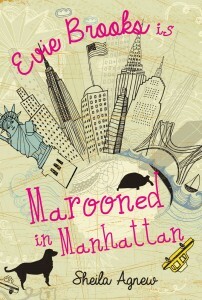 Evie wants to stay in Ireland with her mum’s friend, but she agrees to try New York for the summer. Uncle Scott is a vet, and the tween spends her days helping out at his clinic, making some new friends, and learning what Scott’s snooty girlfriend thinks of his new charge, which is not much. By the end of the summer, Evie has decided to stay after all, a predictable outcome—not so predictable, however, is a final twist that paves the way for a sequel. VERDICT An enjoyable, light read that will particularly draw in animal lovers, who will learn a lot about animal care from Evie’s work with Uncle Scott.